View cart “Bamboo Spork & Cork” has been added to your cart. Store vegetable scraps, egg shells and other waste in our 1.3 gallon recycled stainless steel kitchen compost bin. The bin includes a filter capable of absorbing odors for four to six months. Store vegetable scraps, egg shells and other waste in our recycled stainless steel kitchen compost bin. The bin includes a filter capable of absorbing odors for four to six months. 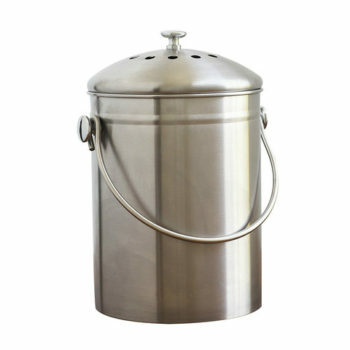 Made from recycled stainless steel, this sturdy bin holds food scraps until they’re transferred to an outdoor compost area or to your green waste bin. The Kitchen Compost Bin makes an attractive addition to any counter top, or a thoughtful gift for an environmentally conscious friend. For best results, set up a small area in your backyard or your garden where you can empty your compost pail whenever it’s full. As the pile grows, you will want to add some dry garden waste to the heap of wet kitchen scraps. In order for your green waste to break down, you need a roughly 50/50 blend of wet and dry scraps. Wet scraps include fresh food waste and fresh, green garden waste, such as fresh cut grass and fresh green leaves. Dry scraps would include things like small wood chips, dry lawn trimmings, and straw. Technically, the wet scraps are rich in nitrogen, while the dry waste is rich in carbon, and it is this nice blend of nitrogen and carbon that will break down effectively and produce a healthy batch of compost that you can use to fertilize all your garden plants. After three to six months, you will want to flip the compost pile over. This can be down by shoveling it scoop by scoop into a new spot in your garden, so that the freshest waste from the top of the old pile ends up at the bottom of the new pile, and the oldest waste ends up on top. Allow the inverted pile to break down for another few months before spreading it like fertilizer. After moving your halfway decomposed compost heap, you should discover a dark, rich patch of soil beneath it. You can stir that soil up a bit, and then plant it right away. To learn more about how to maintain a healthy compost heap for your garden, check out this blog we posted a while back, and consult the Master Gardeners.